Saturday 26th February was a fine day for the second annual 7 a side tournament hosted by Crossmaglen Ladies in association with Crossmaglen and South Armagh Chamber of Commerce and Trade. The group stages saw great challenging games between the clubs which had traveled to St. Oliver Plunkett Park. With the use of the council facilities all four groups played their initial matches simultaneously. Kilmacud Crokes, Drumgoom, Round Towers and Carriakcruppen fought hard to emerge from the group stages to contend the shield competition. In the semi finals Drumgoon seconds were narrowly defeated by Kilmacud, and while Round Towers emerged vitcorous over Carriakcruppen. This left the shield final a local derby, with the two Dublin sides keen to make their mark in Crossmaglen. Nobody can deny the standard of both teams as they took to the field to contest the shield. After the first half, as a spectator, it was difficult to say who was winning as it was tight from the first blow of the whistle. Both teams took to the pitch again and Round Towers happily dropped a goal into the back of the net. This definitely rallied the team, but Crokes did not put the heads down. The final score was Kilmacud Crokes 1.6 Round Tower 2.4. Round Towers returned to Dublin with the shield. There was no doubt that the Cup competition was going to see the strong teams emerge from their groups, and many of the great names in ladies football took their place in the quarter finals. Donaghmoyne, Crossmaglen, Emyvale. Armagh Minors, Clann Eireann, Magherclone, Royal Gaels and Sarsfeilds from Laois all progressed. Great football was witnessed, and epic performances from goal keepers just kept teams in the competition. The first semi final of the cup, saw another local derby, as the Monaghan sides, Donaghmoyne and Emyvale fought for a place in the final. 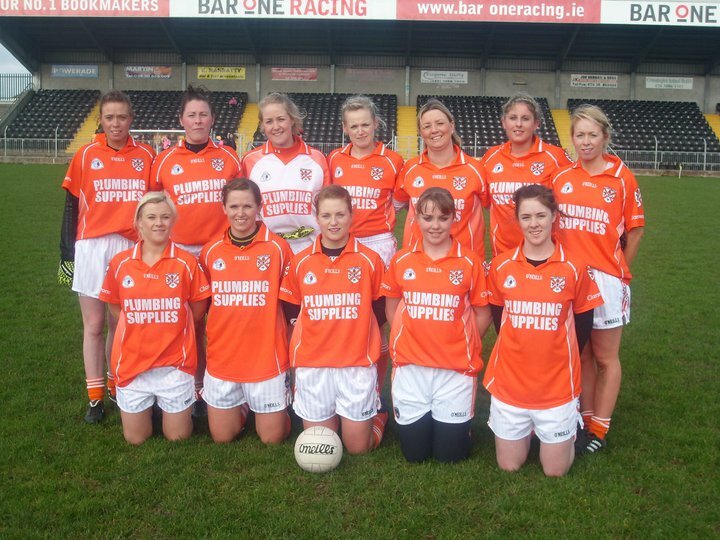 It was Donaghmoyne who made it to the final, with only 2 points difference in the score line. In the other semi final Clann Eireann took on the Laois side. Again it was a close game, but Clann Eireann sealed the deal with a couple of goals. The final was undoubtedly the toughest game of the day. Both teams exhausted, but also eager to play it started and it was clear to see this was not going to be a walk in the park for either team. Laura Brown of Clann Eireann rallied her squad and played an important role in the small lead the team had at half time. However Donaghmoyne were not prepared to let that lead remain, as they took any opportunity to attack and knocked three consequative points over the bar. The use of the rolling substitutions played an important role, as fresh legs give the girls the break they needed to push in this battle. The final score truly reflects the tremendous effort put in by both sides, but it was Clann Eireann who managed to take the cup, with the smallest of margins. The score given by the referee at the end of the match was Clann Eireann 3.6 to Donaghmone’s 1.11. The player of the tournament was nominated by the tournament referees and awarded to Amanda Casey of Donaghmoyne.